OPEC officially extended their product cuts through the end of 2018, which caused markets to run up initially before a steep sell-off, and now prices are back near where they started. Crude prices gave up 43 cents (0.7%) yesterday in anticipation of the OPEC announcement, and are today struggling to find a direction, having been down and back up since the OEPC announcement. 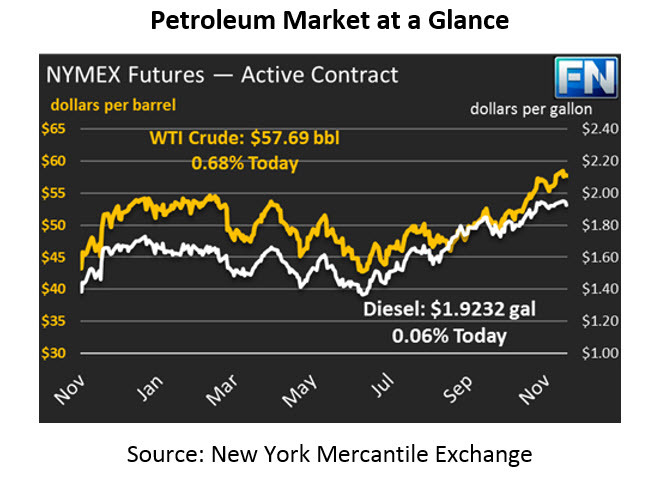 WTI crude is currently trading at $57.69, a gain of 39 cents and a $6.30 discount to Brent crude. That discount was below $5 at the end of last week during the Keystone outage, but the pipeline’s restart has sent Brent-WTI spreads back to their $6.00-$6.50 range. Gasoline prices took a big hit yesterday, shedding 3.5 cents (-2.0%) as the EIA contradicted the API data and showed a large build in gasoline inventories. Gasoline demand was also noted to be more than 800 kbpd below last week’s report – perhaps a pre-holiday anomaly, or perhaps a trend in lower demand. After rising fluctuating lower and higher this morning, gasoline prices are now back up to trading higher, trading at $1.7369, half a cent above yesterday’s close. Diesel prices fell yesterday, though with less force than gasoline prices. Diesel gave up 2.1 cents (1.1%) yesterday, and like gasoline prices rose early this morning but are now trading lower. Diesel prices are slightly higher this morning, trading up just 0.1 cents at $1.9232. The main story of the day will of course be OPEC’s extension. Today last year, OPEC first announced the OPEC/Non-OPEC production cuts, beginning a huge oil price rally that lasted into the new year. Is that what’s coming today? Unlikely. Markets had already priced in a 9-month extension; Goldman Sachs estimates that markets already had a $2.50 premium based on expectations of an extension. Still, the announcement is an important one for markets, as it signals that prices continue receiving support from an active OPEC. The EIA released their weekly data yesterday, which ended up being even more bullish than the API’s report, though for totally different reasons. The API showed a crude stock build, which the EIA showed was incorrect, but the EIA revealed much larger stock builds for refined products. Additionally, nearly all of the drawdown in crude came from the Midwest, where the Keystone kept product from reaching Cushing, Oklahoma. On the product side, refinery runs set a record yesterday as the first time refinery input has surpassed 17 MMbpd in Q4. Demand for refined products, especially diesel, have kept crack spreads high, sending refineries the financial message to keep producing more. While both gasoline and diesel demands were lower in this recent report, crack spreads (the profit from turning three barrels of crude into two barrels of gasoline and one barrel of diesel) are still high. While crack spreads stay high, high refining activity will continue.